Do you know anyone without a laundry dryer? How about someone who’s ecofriendly? If so, this article is for them! If anyone has ever bought high quality bed sheets, it is advisable to take good care of them. Washing them in the washing machine on a “delicate” cycle is one thing but if you want to take it one step further, and try to stretch out their lifespan even more, learn how to dry them outside, on a line. Buy Plastic Clothespins – because wooden ones break faster. Look For a High Quality Clothesline – obviously you can hang your sheets on anything but a line between two pulleys works best. Wash Your Bed Sheets in Cold Water – preferably with a mild detergent which are readily readily available all over the United States. Shake The Bed Sheets to Reduce Wrinkling (if possible ask someone to help for this step) – snap them in the air once or twice. Toss them over the clothesline, folded in the middle. Try to avoid any bunching up or wrinkling from the beginning. Hang bed sheets in a single layer. Place the Clothespins Every 12 Inches – this will hold the bed sheets in place and keep them wrinkle free while they dry. On windy days, use more clothespins as required. Remove the Bed Sheets From the Line When They’re Almost Dry – and put them on an ironing board for a quick iron. This will keep the sheets from becoming rough after they dry in the sun and on the line. 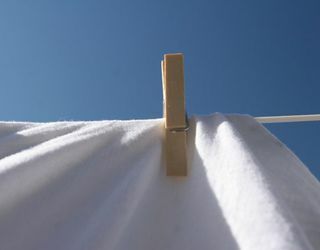 No one will argue the fact that drying sheets on a line and in the sunlight will give your sheets a fresh, natural scent without fabric softener. On top of that, by following the above tips, your sheets will not only have great longevity but you will also save in monthly electric costs, environmental costs and gain a bit of an upper body workout.